Depression Is Possible Side Effect Of Many Common Drugs : Shots - Health News Depression is a possible side effect of 200 medications. Now, a new study finds people who take these drugs are, in fact, more likely to be depressed. The more drugs you take, the higher the risk. Americans are increasingly taking multiple drugs. And depression is a potential side effect of many of them. The list includes a wide range of commonly taken medications. Among them are certain types of proton pump inhibitors (used to treat acid reflux), beta blockers, anxiety drugs, painkillers including ibuprofen, ACE inhibitors (used to treat high blood pressure) and anti-convulsant drugs. "The more of these medications you're taking, the more likely you are to report depression," says study author Mark Olfson, a professor of psychiatry at Columbia University. The study, which was published Tuesday in JAMA, the journal of the American Medical Association, included 26,192 adults who participated in a federal survey, the National Health and Nutrition Examination Survey. All of the participants listed the medications they were taking at the time of the survey. In addition, they each completed a depression screening, the Patient Health Questionnaire (PHQ-9), which asks about sleep, mood and appetite. More than a third of the people who took the survey were taking medications known to have depression or suicidal thoughts as potential side effects. Olfson and his collaborators wanted to determine whether those participants were more or less likely to be depressed, compared to participants who didn't take any of these medications. "What we found is that, in fact, they're more likely," Olfson says. And they found that people who took three or more of the medications were three times as likely to be depressed. About 15 percent of participants who simultaneously used three or more of these drugs were depressed. By comparison, among participants who didn't use any of the medications, just 5 percent were depressed. Even those who used just one of these medications were at slightly higher risk of depression: About 7 percent were depressed. Olfson says the study does not prove that the medications caused the depression. "We're just showing that if you're already taking them, you are more likely to be depressed," he says. To determine causation, he says, researchers would need to follow people over time — beginning at the time they start taking the medications — to see if they're more likely to develop depression. Nonetheless, Olfson says, he was surprised by the "strength of the association between the number of medications and the likelihood of being depressed." These findings may motivate people to ask their health care providers more questions. "People should always be ready to ask, 'What are the risks and the benefits of me taking this medication?' " says Don Mordecai, a psychiatrist with Kaiser Permanente in San Jose, Calif. And he says doctors should be ready to have these conversations, too. Mordecai says, if you start a new medicine it can be helpful to keep track of changes in how you feel. "People who don't have a history of depression and then, suddenly, start to have symptoms of depression should be concerned that it's potentially due to a side effect, or potentially, an interaction," Mordecai says. It's also worth having a conversation with your doctor about whether you might be able to stop a medication, Mordecai says. For instance, it may be possible to go off — or reduce — a medication for high blood pressure if you make other changes "such as changing your diet, limiting salt intake, or increasing exercise." 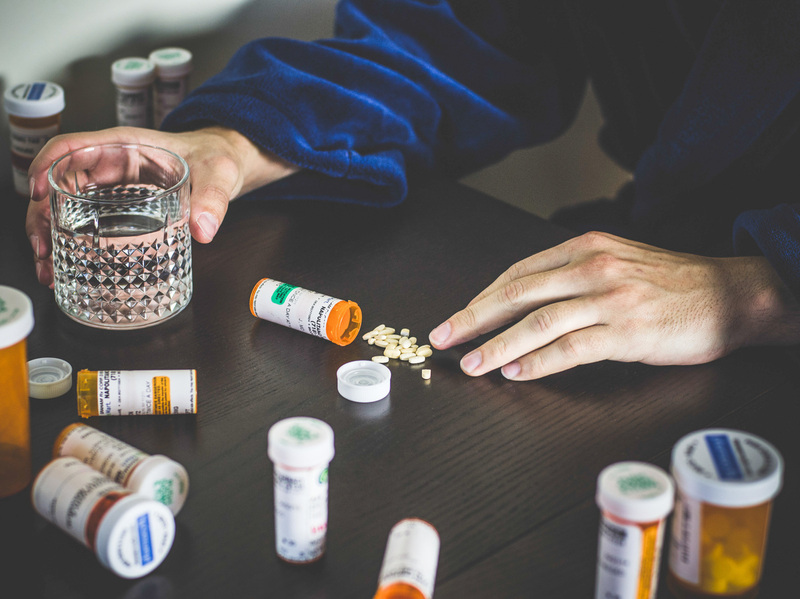 Use of medications with depression or suicidal thoughts as potential side effects has been on the rise, according to the study's lead author, Dima Mazen Qato, an assistant professor at the College of Pharmacy of the University of Illinois, Chicago. "People are not only increasingly using these medicines alone, but are increasingly using them simultaneously, yet very few of these drugs have warning labels, so until we have public or system-level solutions, it is left up to patients and health care professionals to be aware of the risks," Qato wrote in a release about the study findings. Qato says physicians may want to consider including evaluations of medications when they screen for depression. "With depression as one of the leading causes of disability and increasing national suicide rates, we need to think innovatively about depression as a public health issue," Qato writes. She suggests that one strategy to reduce depression rates might be for health care providers to give more thought to the role these medications might play in depression risk. Allison Aubrey is on Twitter: @AubreyNPRFood. Editor's note, June 13, 2018: The headline of this story has been changed to better reflect the content of the story.